Welcome to the newest member of the JMR team, AKA Mommy. Think you have what it takes to write for us? Shoot an email to jewishmusicreport@gmail.com. How better to describe the goings on (or lack thereof) in my home over these past few cold and snowy weekends than with Dr. Seuss’s opening words of The Cat in the Hat? “The sun did not shine, it was too wet to play. So we sat in the house all that cold, cold, wet day. While my kids had been asking for snow for months, by the time Winter Storm Jonas was over, they were restless and just needed to let out some energy. Thanks to Chava Goldman, our winter blues were quickly transformed – all smiles in this household as we set off on this engaging exercise journey. Set to the theme of an Ocean Adventure, imaginations run wild. The listeners are assigned the role of a sailor crew, while Captain Chava Goldman gives the orders. With waves crashing in the background and catchy beats and tunes, kids can easily step into character and get ready for action. 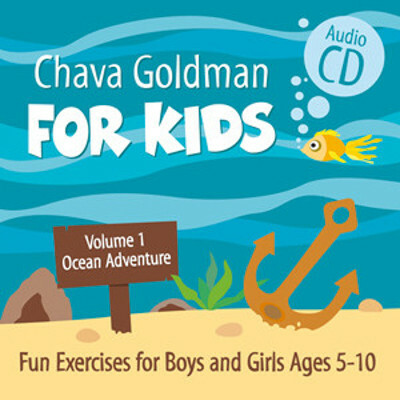 Track One – Chava Goldman sets the stage, with oceanic sound effects in the background to really get listeners into the mode. The adventure starts off on deck of the ship, which serves as the platform for the exercises to follow. Track Two – The sailors are running from one end of the deck to the other, with a variety of marching, kicking, tiptoeing and other aerobic paces. Listen out for the Admiral – when he blows his whistle, the Sailors must stop what they’re doing and run in place. This added some hype and excitement to the exercise routine, and kept the energy level at super-charged. Track Three – Sailors love to jump around, and these would-be Sailors are no different. Standing on deck, jumping from forward to center to back and then to center; from right to center to left and then to center; and then a combination of the two, jumping forwards and backwards, and right to left. The music kept picking up speed, with a funky beat keeping the energy on high. Track Four – For this exercise, the listeners take on a new role, acting like stormy waves. Arms up and down, crouching low and standing up tall, running in place with “pitty patty feet.” The variety of movements from track to track keeps the exercises interesting and engaging. Feeling a big seasick from all the ups and downs? The pace slows down a bit as the waves wash over the deck of the ship and knock the listeners down. Some aerobics against the wall help the “Waves” recuperate before the stormy waves hit and the pace picks up again. This segment is a bit long, but Chava Goldman encourages the listeners to chant along with her in an effort to keep the momentum going. Track Five – The stormy waves have swept the Sailors ashore, and the scene is set in a jungle. Mimicking hairy gorillas, jumping frogs, crawling spiders, leaping kangaroos and flying seagulls, the listeners are in a constant state of motion. The music and sound effects help with the visualization, and it becomes really easy to get into character when imitating each of the different jungle animals. All aboard – the Captain is waiting for her crew on deck! Track Seven – All good sailors get hungry, and beans are on the menu for lunch today. There are four different types of beans, and each bean is represented by a different action. When the Captain calls out “Runner Beans,” the Sailors run around all over the place as quickly as they can. “String Beans” – balance on one leg with the other leg in air in front of you, holding your hands together over your head. When the Captain calls out “Canned Beans,” listeners do jumping jacks, and for “Baked Beans,” the Sailors lie down on the floor with arms and legs spread wide apart, as though they’re baking in the sun. The first few times, the Captain reminds the Sailors which action is represented by each bean. After a while, though, the Sailors are on their own, putting their memory skills to the test. Track Eight – After working night and day on the ship, it’s time to welcome Shabbos in. The Sailors lie down and relax, with Shalom Aleichem playing softly in the background. Captain Chava Goldman guides the Sailors through all sorts of stretches, encouraging relaxation and deep breathing after such an energetic and engaging workout. The theme was carried out beautifully throughout all eight tracks, and was very relatable to the younger kids. As they traveled from sea to shore, through stormy waves and into calmer waters, their imaginations ran wild. This CD was fun, engaging and stimulating, and I love that it brought out so many important life skills for young children. From balancing to counting, from listening to following a sequence of instructions, Chava Goldman’s Ocean Adventure is a piece of quality kosher entertainment. My kids were smiling the entire time, and there was a lot of laughing going on – unless it’s me they were laughing at as I tried to keep up with the exercises alongside them?